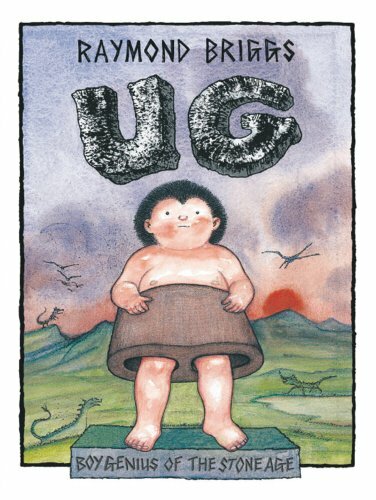 DESCRIPTION FROM THE PUBLISHER: Ug and his parents are living in the Stone Age. And that means stone blankets, stone cold food, an even colder cave and, worst of all, hard stone trousers! Being an inquisitive and intelligent child, Ug suggests a series of modifications to improve the quality of family life. His ideas about heating, cooking, boats, and balls that actually bounce are met with a hostile reaction by his parents who don’t know what he’s going on about. Even Ug himself is occasionally unsure of the purpose of his inventions – his round stone that rolls down the hill is great, but what is it actually for? With the help of his father, who is slowly coming round to his son’s way of thinking, Ug comes tantalisingly close to his ultimate garment goal, only to find that there are some obstacles even a boy genius can’t overcome. IDEAS FOR USE: Link our ‘digs and dinos’ projects to studying The Stone Age. Have a go at making salt dough dinosaur fossils and bones.